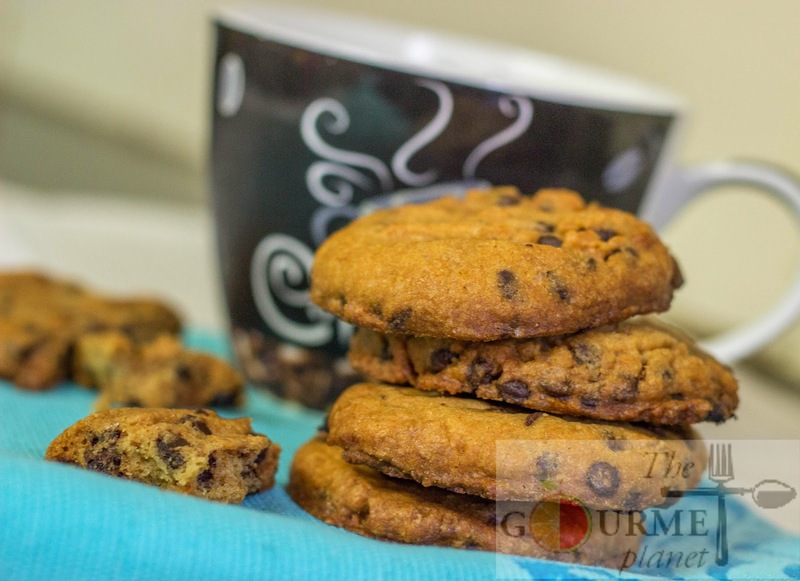 Culinary Delights from My Kitchen: Choco Chip Cookies...A Timeless Bliss! Today's post is a recognition of my efforts. Yes, at time i do indulge in self-appreciation. Such a confidence booster it is! Try it, you will feel good about yourself. Self motivation is necessary for moving on ahead. When i travel down the memory lane of my past, something that i would never find myself connected with was 'FOOD'. Shocked?!? Yes, thats true!! I am amazed as well when i compare my past with today. A drift altogether. I sincerely dont recall any time which dates back to my childhood, where i have spent my time in the kitchen with mom, helping her or showing interests in household or kitchen errands. Although, the joy of savoring a delightful meal with good flavors even then was as important as it is today. I still remember very clearly that when i used to visit home during my vacations (while i was doing my grads), mum always often used to get angry, worrying for me not having any interest in household stuff and cooking especially. Till my post graduation, she had been brooding over my lack of involvement in Kitchen, especially when my counterparts in our locality and in my family had taken up those responsibilities from their moms, voluntarily. My love story with food and kitchen started late but not very late. Thankfully it happened before i got hitched. Else imagine,what tough time i would have given to my dear husband! Well, I have traveled places after my schooling. A few places journeyed for further studies and some while i was working. Well, the trip has been joyful and full of learning. Fortunately, cupid struck me at this point! Its so aptly said, things that are destined to occur will happen come what may! My passion for food & culinary arts was evolving and growing and I solely give credit to my stay at different cities where i got the opportunity to cook by myself (simply to survive initially) and got to learn variety of regional stuff. I started with basic home food and Rotis being my fear always! It were of all other shapes but round. Did not know that my mom in law, would teach me how to roll them. And now i have mastered them so much, that my MIL cant stop praising me for those thin, round delicate piece of rolled bread. Aah! Sense of victory. My next step was to attempts meat. Tried it too and accomplished! Next in queue was baking which was a fear too, two years back, a result of feedback from people whose experiments with cakes & bakes had been a disastor.Baking is tricky!! It requires precision, accuracy and most of LOVE! Believe me it does. My self learning, determination and aspiration to move ahead got me over my baking jitters as well. Now i bake a cake quite often at home. I bake when i am happy, i bake when i am stressed. It my true true love. So home cooking done, meaty experiments done, cake baking perfected. So whats new! My research on world cuisines is on and shall continue coz thats vast and varied. A bit more of baking (is what y heart says..always), i know, i know, coz i have a special sweet corner for baking & for the baked delicacies..such dainty beauties they appear to me!! They all seem to be so loveable. So my todays post is my next step on baking. Today's delight is everybody's all time favorite. From a kid to an elderly person. All have loved it always and continue to have them in whichever form or shape they like, based on their personal preferences. Its none other than our all time favorites 'Cookies' or Biscuits as we term them here in India. Had never baked cookies ever ever before and honestly was taken aback when i realised that its the easiest thing to make!! My experiments with Cake have given me a difficult time at times. But my Choco Chip Cookie, a vintage pleasure was a success in one go! 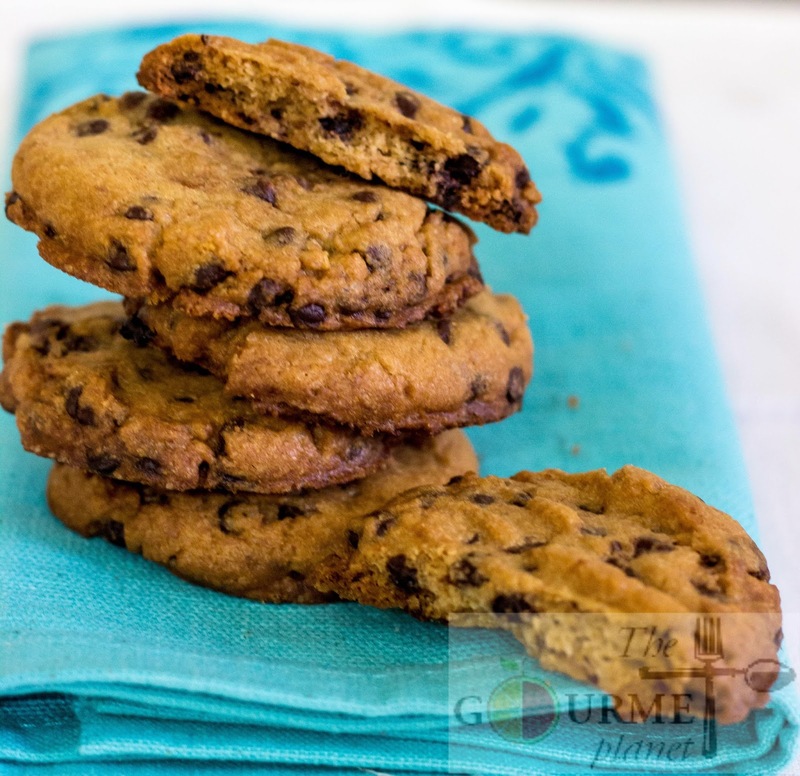 Choco chip cookie is a simple, easy, super duper quick and a classic indulgence which is a MUST MUST if you ever plan to bake cookies for the first time. A bit of tender, fudgy chewiness but an edge of crisp bite explains my idea Choco Chip Cookie. 2. Put the brown and white sugars into a bowl and add the butter over them and beat together with a hand beater or stand mixer. 3. Add in the vanilla, the cold egg and cold egg yolk to the beaten sugar - butter mixture until its light and creamy. 4. Slowly mix in the flour and soda to the mixture and blend lightly to just ensure all has been mixed well. 5. Then fold in the chocolate chips. DO NOT beat with the hand mixer at this stage. 6. Wrap the dough in a cling foil and refrigerate for and hour. 8. Whenever you plan to bake the cookie, get the dough out of the refrigerator and scoop out the cookie dough with the help of an ice cream scoop or drop and equal size of cookie using your hand. 9. Drop the cookie dough onto the prepared baking sheet and ensure each small cookie dough is 3inches apart as while baking the cookie would spread out. NOTE: You will need to make the cookies in batches hence keep the bowl of cookie dough in the fridge between batches. 10. Bake for 15–17 minutes in the preheated oven, or until the edges are lightly toasted. Cool on the baking sheet for 5 minutes before transferring to wire racks.